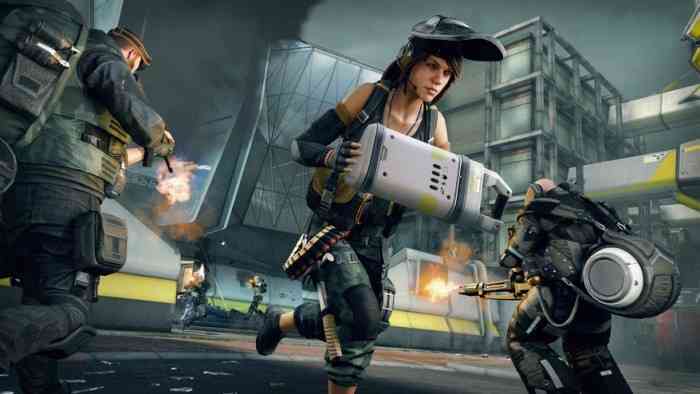 Dirty Bomb, the free-to-play online shooter developed by Splash Damage Ltd., today launches its biggest update of the year so far; ‘Rogue en Vogue’. This update provides a wealth of new content for players, including the new Merc Aimee, who’s equipped with an array of Sniper Rifles and SNITCH Device which spots and weakens enemies, along with a player-driven in-game event offering Limited Edition Loadout Cards, Trinkets and more. The Rogue en Vogue event takes place over five weeks. During that time, players help Aimee hack into the MercSERV database to uncover who assassinated her client, Max Bashki. In the process, players get to unlock exclusive Trinkets and Limited Edition Loadout Cards. Each week, four Mercs are designated as Suspects and put into free rotation for all players to access. The Merc most taken in Squads will be listed as a ‘Prime Suspect’. In the fifth week, all four Prime Suspects will be placed into the final rotation, after which the most-taken Merc in Squads will be revealed as the Culprit. Rogue en Vogue introduces a limited-time event currency called Decryption Cycles. Players earn them by playing in matches, completing special Missions and can also buy them with the existing in-game currency, Credits. Cycles can be used to unlock a number of items including the unique Culprit Case, which can be opened once the event is over and contains an exclusive Loadout Card featuring a Limited Edition skin for the Culprit. Along with the Culprit Case, players can also acquire ‘Suspect Equipment Cases’ which give players the chance to obtain Limited Edition Suspect Loadout Cards for Mercs on rotation each week, and three unique Weapon Trinkets depicting levels of MercSERV security. Once players complete matches, along with earning Cycles they also have a chance to receive a Suspect Event Case, which guarantees a Limited Edition Suspect Loadout Card. Drop chances can be increased by using Drop Boosters, which can be purchased with Cycles. Skullsplitter Trinket ($4.99): As well as acting as a grim reminder of Aimee’s ex-client, this Trinket gives players a Cycle earn rate bonus for the duration of the event as well as a permanent special animation in the kill obituaries. Vengeance Obsidian Pack ($ 14.99): The new Merc Aimee will be available bundled with the Obsidian Culprit Case, which unlocks one of Dirty Bomb’s most exclusive tier of Obsidian cards and skins for the Culprit after the event ends. While the Rogue en Vogue Update is the largest yet this year, new features and gameplay improvements based on feedback from the community have continually been added since Open Beta began, including: Ranked Seasons, Private Matches & matchmaking improvements, Surrender & Match Restart functionality, player reporting, a new anti-cheat system and more. Download Dirty Bomb for free now and jump into the action, or learn more at DirtyBomb.com.